It serves as the official home of Open VetSim, an open-source hardware and software platform for creating immersive veterinary simulators. All of the software is free to download and modify to your needs, and instructions for how to build your own simulators are available. We also host a repository of pre-programmed clinical scenarios that can be run on the platform. This site also serves as a clearinghouse for information about a wide range of commercial and DIY veterinary simulators. Read reviews of simulators and comment on your experiences. 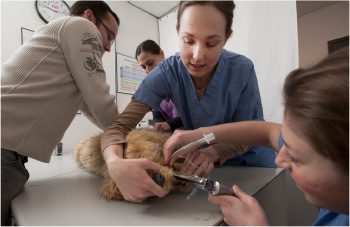 Finally, we provide a forum for discussion about veterinary simulation technology, the use of simulation in veterinary education, and discussion about the Open VetSim platform. Other Vet Simulators and Events should be set up as blog pages that we’ll be adding content to. I can go in and create some blog entries for those pages once they’re set up. For the “Other Vet Simulators” page, we had talked about adding a review system so people can give a star rating for each simulator and enter comments. Only registered users of the site can comment.